Sussex cricket manager Mark Robinson will be head coach for the England Lions tour to Sri Lanka in early 2014. The side will play three four-day Tests against the Sri Lanka A team, with the full schedule yet to be announced. ECB performance director David Parsons said: "We are delighted to give Mark the opportunity to come into the England Lions set-up. "This should provide him with an excellent opportunity to learn what the England cricket programme is about." He added: "Also, we will be able to benefit greatly from Mark's experience as one of our leading coaches within the first-class game." Selection for the England Lions side will take place in mid-December, with the squad announcement being made before the end of this year. The touring party will arrive in Colombo on 27 January and depart on 2 March. 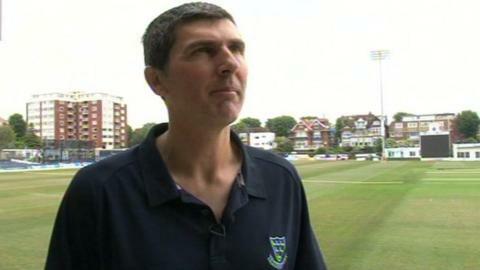 Robinson, who has been cricket manager at Hove since late 2005, has previously taken charge of the England Under-19 side. Parsons believe the tour to Sri Lanka will proved a good test for the Lions. "Training and playing competitive cricket in challenging conditions against tough opposition is always a great way for our players to further their individual games," he said. "This tour will act as an important part of developing and identifying the England players of the future."